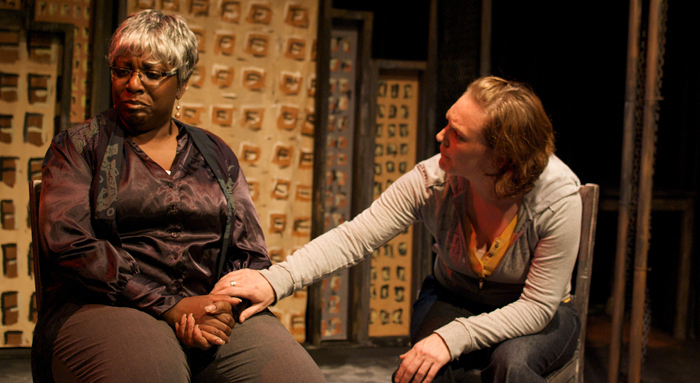 Sam (Stephanie Stroud, right) consoles her distraught neighbor (Deanna K. Reed). Director Rachel Edwards Harvith and playwright Jacob Juntunen have really interesting things to say about the inspiration behind Under America, Mortar Theatre’s latest ambitious effort. Harvith argues how the “el culture” — created by our need to form protective bubbles around us on the train through iPods, sunglasses and books — has caused us to ignore our neighbors. “Under America … challenges us to look around ourselves and see the human being behind the book, behind the phone … to tear down the walls … we build between ourselves and others,” she says. And Juntunen notes how a particular statistic caught his attention: 1 in 8 black men are in prison. He then thought of Dostoyevsky’s words: “The degree of civilization in a society can be judged by entering its prisons.” This set him on an emotional journey that evolved into this play. There are a lot of big ideas here. The broken legal system, racism, gentrification, going outside your protective bubble, the mishandling of Cabrini-Green by the Chicago Housing Authority. Where do you start? How do you make it into a cohesive play that both engages and enlightens? With Under America, the result is a piece containing several murky story lines that compete for our attention. We have Sam (the striking Stephanie Stroud), a struggling, 29 year-old Chicago Tribune reporter who has one final shot to keep her job by making a seemingly dry series of stories about public housing gentrification work. In a bold move, she decides to camp out at Cabrini-Green, which is just a few blocks from her Gold Coast condo purchased by her right-wing parents, to meet some of the locals and personalize the series by using their stories. She soon befriends Dorothy (Deanna K. Reed, giving a standout performance), a widowed grandmother who’s taking care of her grandchildren at Cabrini. Eventually, Sam finds herself caught up in the struggles Dorothy’s family — the youngest, Michael (the intense Jon Sharlow), has gotten into some legal trouble. Always a reporter, Sam uses this tragedy to her journalistic benefit, and discovers that profiling Michael’s situation in her series doesn’t quite have the impact she’d expected. Oh, yeah — and Sam’s also a closeted lesbian, and her assignment is causing stress on her relationship with her uptight lawyer girlfriend (Helen Young). We know the relationship is serious because they’re buying a couch together online. Not only is this subplot severely underdeveloped, it’s unnecessary — much like several of the ideas in this play. Juntunen’s obviously a talented writer, but I feel he’s undermined himself here by embracing too many ideas — and approaches for exploring those ideas — than one play could possibly ever support. I wanted more exploration into the relationship with Sam and the family she befriends at Cabrini-Green. The entire second act — some sort of Xanax-inspired fever dream by Sam paired with a hallucinatory trip through the bowels if the Chicago prison system where Michael meets a figure (possibly his father?) who’s now a mincing queen that plays with cats — is essentially unnecessary. And confusing. At one point, I thought the play had turned into the 1992 film Candyman. And cut the lesbian stuff. Harvith’s direction does a good job trying to make sense of this fractured story, though the numerous scene changes need tightening — there are far too many blackouts with actors needlessly moving chairs and tables. Doing so may trim some of the 2 hours and 40 minute running time (with two intermissions). There’s a powerful play in there — just tell the story and remove the excess. Strong performances keep this massive “idea play” afloat. While, to me, this is a minor misstep for Mortar, the ambition and desire to say something meaningful is certainly there. I look forward to Mortar Theatre’s next effort. Did you think that the subplot was unnecessary to the point that it should have been completely cut out? Did you already gather that there were enough conflicts between Sam’s personal life and the assignment? Good question, Mary. I think if the play wants to be about the struggle with Sam trying to effectively find the “real story” in her expose, it should focus on that. She just had too many conflicts going on with her parents, her internal conflict, and the Cabrini-Green family she met. Poor Sam was being pulled in too many directions. I’m usually a fan of simplicity in storytelling (must be the editor in me), so I’d cut her relationship problems.